What personally identifiable information Nitewalkerpreamp.com collects. How Nitewalkerpreamp.com uses the information. With whom Nitewalkerpreamp.com may share user information. 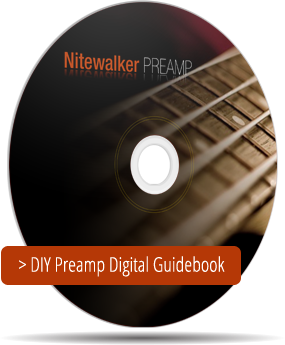 Nitewalkerpreamp.com is the sole owner of the information collected on our site. Nitewalkerpreamp.com collects and monitors information from our users at several different points on our web site. In order to use the services offered on our web site, a user must first complete the registration form. During registration a user is required to disclose contact information (such as name and email address). If offered, it is optional for the user to disclose demographic information (such as income level and gender), and unique identifiers (such as a username). We do encourage full disclosure of these details in order for Nitewalkerpreamp.com to provide a more customized experience on our site. While Nitewalkerpreamp.com exercises all due caution to protect your privacy, Nitewalkerpreamp.com will not be held responsible for parties who attempt to illegally access our web site and intercept or access transmissions or private communications. Nitewalkerpreamp.com stores information collected through cookies, log files and/or third interests in your user profile. A profile is stored information that we keep on individual users detailing specific viewing preferences. Subsequently, this collected information is linked to users’ personally identifiable information,which provides directs pertinent marketing promotions to you and helps us improve site content for the user. Nitewalkerpreamp.com does not share your profile with other third parties, unless specifically mentioned elsewhere in this policy. Though we exercise all due caution to preserve user privacy, we may need to disclose personal information when required by law wherein we have a good-faith belief that such action is necessary to comply with a current judicial proceeding, a court order or legal process served on our Web site. This includes, but is not limited to, any defense to any claim in which Nitewalkerpreamp.com is a defendant, to assist in any investigations by law enforcement agencies, or violations of any Nitewalkerpreamp.com policy. In the event Nitewalkerpreamp.com goes through a business transition, such as a merger, being acquired by another company, or selling a portion of its assets, users’ personal information will, in most instances, be part of the assets transferred. Users will be notified via e-mail, as well as with a prominent notice on our Web site for at least 30 days prior to a change of ownership or control of their personal information. If as a result of the business transition, the users’ personally identifiable information will be used in a manner different from that stated at the time of collection they will be given choice consistent with our notification of changes section. This web site may contain links to other sites. Please be aware that we, Nitewalkerpreamp.com, are not responsible for the privacy practices of sites other than our own. We encourage our users to be aware when they leave our site and to read the privacy statements of each and every web site that collects personally identifiable information. This privacy statement applies solely to information collected by this web site. Nitewalkerpreamp.com may have co-branding and/or framing relations with other companies. In this case, you should be familiar with the privacy policies of both companies, since you may be subject to each of them.